This is an electron microscope image of a bacterium from genus Prochlorococcus. 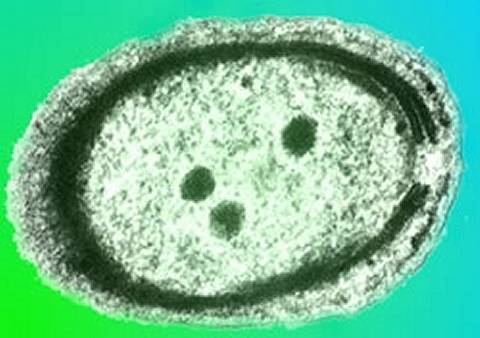 The image you see above is of a tiny bacterium from genus Prochlorococcus. It is part of a phylum of bacteria called Cyanobacteria, and the members of this phylum are an incredibly important part of the world’s ecosystems. They live in water, converting sunlight and carbon dioxide into sugar and oxygen via photosynthesis. Estimates indicate that cyanobacteria are responsible for producing about 20 to 30 percent of the earth’s oxygen supply. Prochlorococcus are particularly important cyanobacteria. They are thought to be the most abundant photosynthetic organism on earth, with an estimated worldwide population of an octillion (1,000,000,000,000,000,000,000,000,000).1 More importantly, they tend to live in parts of the ocean that are nutrient-poor. Their photosynthesis helps to alleviate this problem, of course, making them a food source for other organisms that might try to live there. Dr. Sallie Chisholm at the Massachusetts Institute of Technology (MIT) first described the organisms in 1988 and has continued to study them over the years. She and her colleagues were recently looking at them under an electron microscope and noticed what she described as, “these pimples – we call them ‘blebs’ – on the surface.”2 Dr. Steven J. Biller, a microbiologist who is also at MIT, recognized the blebs as vesicles, which are tiny “sacs” made by nearly every cell in nature. Since the vesicles were found on the surface of the cell, the scientists decided the bacteria were using them to get rid of whatever was inside the vesicles. They studied the water from their laboratory samples and found that it was, indeed, rich with vesicles that had been released by the Prochlorococcus, and they were surprised by what they found inside. It is perhaps surprising that Prochlorococcus, or other microbes growing in the nutrient-poor oligotrophic oceans, would continually export nutrients in the form of membrane vesicles. Prochlorococcus, for example, has adaptations that reduce its phosphorus and nitrogen requirements, including the use of sulfolipids instead of phospholipids and a proteome with relatively low nitrogen demand. Vesicle release seems inconsistent with the need to make efficient use of limited resources that presumably underlies these adaptations. To make sure that the voluntary release of these limited resources wasn’t an artifact of the bacteria being cultured in the laboratory, the authors examined ocean water from two different regions that have large Prochlorococcus populations, and they found that the water was full of these nutrient-rich vesicles. Based on their limited observations, they estimate that as many as 10,000 to 100,000 tons of useful chemicals might be dumped into the ocean every day by these generous bacteria. Why would the bacteria do something like this? The authors say that they can only speculate. Perhaps they are “feeding” other organisms that help to promote their growth. It is known that Prochlorococcus can do better in the presence of certain other organisms, so perhaps they are producing a good environment to promote the growth of those organisms. It’s also possible that these vesicles act as decoys, fooling viruses into attacking the vesicles instead of the bacteria themselves. Finally, it is possible that they are being used to distribute useful chunks of DNA to other Prochlorococcus and all organisms that benefit their growth. I would add one more possibility that the authors didn’t consider. Since they grow in nutrient-poor conditions, it is possible that these bacteria comprise one of the many negative-feedback mechanisms that the Creator folded into His creation. They could be designed to seed nutrient-poor areas of the ocean with nutrients so as to promote the viability of the ecosystem as a whole. If further research shows that the vesicles benefit a wide variety of organisms (even the ones that don’t necessarily help the Prochlorococcus), that would probably be the most likely explanation.